I recently described Daniel Day-Lewis's performance in Gangs of New York as a blend of Method-style naturalism and exuberant artifice. To an extent, that same description fits the whole movie. 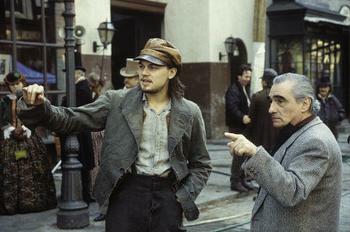 Scorsese first earned his fame as a practitioner of a certain kind of cinematic realism. What are generally considered his greatest worksMean Streets, Taxi Driver, and Raging Bullpulsate with the jittery rhythm of the New Wave films they emulate. The influence of Godard, in particular, can be felt in Scorsese's depiction of street-lifea world of seemingly spontaneous compositions inhabited by quirky and energetic characters who constantly bump into one another and are always, figuratively if not literally, on the run. Granted, even in these early features, Scorsese's eye is as careful in its observation and his shots as meticulous in their contours as Kubrick's. However, the fast-paced dialogue, the quickly-moving camera, the sense of immediacy rather than distance, all serve to create, in Roger Ebert's words, "a heightened riff on reality." (Though Ebert was actually describing Marlon Brando's acting in On The Waterfront, his phrase is perfectly applicable to Scorsese's distinctive style.) The impression of an alert, documentary-style filmmaking is never far from the black-and-white, frantically-moving images in Raging Bull's fighting sequences, or the slowly drifting camera capturing snapshots of New York's seedy nightlife in Taxi Driver. There was something fresh, unstaged, unpredictable, and utterly real about these movies. Then, Scorsese tried something new. He turned to the grand costume drama, executing meticulously staged works that were as much visual feasts as their characters were restrained and their performances unnatural: The Last Temptation of Christ, The Age of Innocence, Kundun. In the nineties, there seemed to exist two separate Scorseses: the poet of the streets, filming the lives of city-dwellers and criminals in an unsparing light full of realism and pathos (think Goodfellas); and the virtuoso painter, constructing shots that seemed to spring from DeMille, and transporting us far from not only the modern American city, but reality itself (think Kundun). Of course, he made films that fit neither category, or blended the two, but it wasn't until Gangs of New York that these opposing strands were successfully wedded. I believe that in this context, Gangs of New York can be more fully appreciated for the monumental work that it isin many ways the magnum opus of one of the most brilliant careers in film. It's a grand period drama, with none of the feel typically associated with the period drama. The style is too direct, too alert, too urgent to properly fit its costumed setting: this is the past depicted as if it were now. 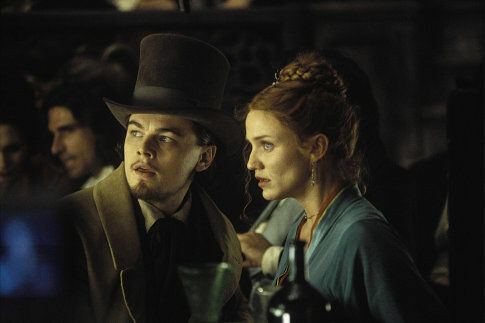 Eschewing many of the pretensions of the ordinary costume epic (which, by contrast, The Age of Innocence adopted whole-sale), Gangs of New York winds up being the most immediate period piece I can recall. (Note that immediate does not mean best: as much as I adore Gangs, it's not quite Rashomon or The Passion of Joan of Arc). It's visceral in a way that few films manage to be. I'm not talking about the rampant violence (which does play an integral part), but rather about the sheer sense of life that permeates the filmlife that's spilling out of each shot, that can't be contained within the frame. Much of the time, the camera is weaving its way through streets, creating full circles out of its motions, swooping up, down, and around to capture the smallest (or most glaring) detail: a pickpocket at work, transvestites conversing on a corner, a dead body in the middle of a busy thoroughfare ("Is that man drunk? "/"Dead as Good Friday, miss"). As a result, there's a 360-degree feel to the movie, if that means anything at all. In other words, I can imagine Gangs projected on a screen that extends from one end of the theater to another in a full circle, the entire stretch of the image bustling with movement while at the same time crafted with the utmost care. So many historical movies claim to transport us to a different time and place, to make us feel like we're really there; Gangs, unlike most others, succeeds. Scorsese here is like a latter-day Sternberg in that he knows just how to crowd his shots with props, people, and details, and create the impression of a continual overflowing of sounds, actions, and images. While Dante Ferreti's glorious sets deserve credit, it's chiefly Scorsese's virtuosity as a filmmaker and his masterful command of the setting that instill the whole movie with such a palpable sense of place. We see the Five Points, we move through the Five Points, we hear the Five Pointssometimes it's as if we could even smell the Five Points, so vivid is this locale's depiction. But what makes the movie really work is nothing Sternbergian. Cutting against the tradition of the staid (or rousing and gory, e.g. Braveheart) costume drama, Scorsese peoples his world with fast-talking criminals and low-lifesthe kind of folks he's loved all along. In conception, Gangs is like a mob movie à la Goodfellas or Mean Streets, only planted back a hundred and fifty years ago. Or rather, it continues the same tradition of studying New York's underworld that produced Scorsese's most recognized triumphs, and exports that tradition to an era of the city's history that has hardly ever been depicted on film. That is why this movie can and should be interpreted as an appropriate culmination of much of Scorsese's oeuvrethe marriage of the costume epic and the New Wave-style street-life picture. It's an accomplishment that few critics bothered to notice. Rarely does a movie simultaneously work as a sprawling epic, in every sense of the word, and a precise study of details. 2001, Aguirre, the Wrath of God, Birth of a Nation these films are not concerned with the small things nearly as much as they are wedded to the big picture. 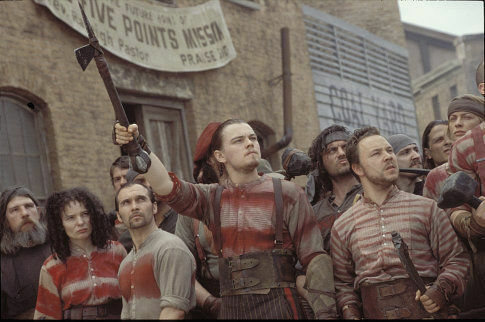 Gangs of New York manages, in a feat of unbelievable ambition, to ground nothing less than a reappraisal of American history (how much broader or more epic can a movie's concept be?) in a veritable collage of carefully observed dialects, expressions, individual beliefs and forgotten traditions. Its dialogue is sprinkled with wonderful words and phrases plucked from the period ("turtledove," "chiseler", "it takes a lot of sand to . . ."). The screenplay is marvelously rich in idiomatic language, and the actors ably lend a variety of accents to deliver it: Day-Lewis's over-the-top New Yawkese v. DiCaprio's Irish-meets-American v. Brendan Gleeson's full-fledged Irish v. Jim Broadbent's slightly British-tinged American. Forget the sets: simply the way the characters talk is a chronicle of the times. Consider also their names. Has there ever been a cast of characters as colorful as that consisting of Walter "Monk" McGinn, "Happy" Jack Mulraney, "Hell-Cat" Maggie, and, of course, William "Bill the Butcher" Cutting? Names do, in fact, play a significant role in the film. Besides the more obvious connotations of "Priest" and "Butcher," the name of the young hero, Amsterdam, is of particular interest. He is the son of Priest Vallon, part of a gang of Irish immigrantsthe Dead Rabbitsseeking to secure their claim in the New World from the threat of the Natives, led by Bill the Butcher. If, as it seems, Vallon has named his son after New Amsterdam, the old name of the city before the English seized it from the Dutch, then he is trying to link his heritage to American history. His son's name harkens back to an age long before these Irishmen (or even the Butcher's ancestors) came to the New World, and may thus be interpreted as an attempt to solidify the boy's ties to the land, to establish him as part of a definitively American tradition. Though Amsterdam was not even born in New York, his name reflects the city's rootsas if the name was a way of saying "I am a New Yorker!" Intriguingly, the Dead Rabbits' agenda is not exactly to assimilate: they hold on tightly to their traditions, customs, and to their Irish Catholicism. There's an ambiguous duality at play in Amsterdam's name. As he is the member of a new generation of immigrants, his name represents an attempt to erase the Irish identity, while he himself fights to maintain it. The scene in which he meets Bill the Butcher for the first time as a man has a great bit of dialogue. Bill asks him: "What's your name, boy?" Our hero responds: "Amsterdam, sir." Bill: "Amsterdam? I'm New York." In this brief but important exchange, the movie emerges as a meditation on the identity of the city itself this melting pot (or, as Amsterdam prefers to call it, "cauldron") of different names, communities and, in the film, tribes. What are, in fact, New York's roots? Gangs is, among other things, a valiant attempt to grapple with that question. That's what I love most about the movie: its marriage of small moments and audacious scope, of foregrounded details and far-reaching questions. No one but Scorsese could have made this picture. It is a summation of his career, his style. 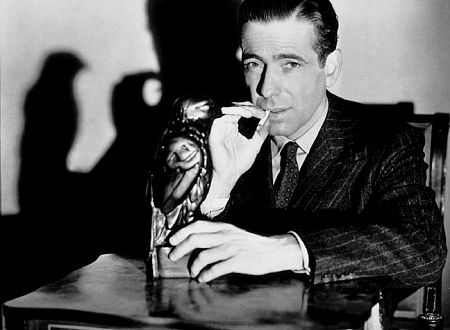 Though "summation" may be the wrong word, since no one movie can "sum" up a master director's body of work, it is a sign of Gangs' greatness that its vision, feel, and conception are so quintessentially those of its maker. Scorsese has always loved to experiment, to stretch the boundaries of film, and here he succeeds in doing so on a grander canvas than ever before. Let me be more blunt: Gangs is the most audacious experiment in American film since the seventies. By experiment, I don't mean playing around with some neat technique, à la Memento: I mean creating something truly new. I've already explained how Gangs subverts the ordinary practices of costume dramas. In a similar vein, it unifies a strong sense of the theatrical with Scorsese's eye for seemingly unstaged and spontaneous eruptions of life on the street. As I noted in my last post, Bill the Butcher occupies his territory as if it were a stage and he were the principal actor. Note his fake-crying when he brings the slain rabbit to his policeman associate"I want you to punish whoever's responsible for murdering this poor, helpless rabbit. . ." Never have I seen a more marvelous example, at once hilarious and disturbing, of a performance within a performance. 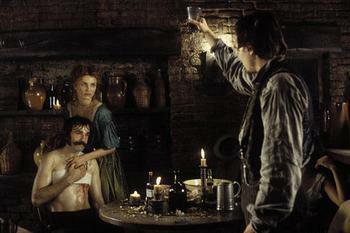 Note also the prevalence of theaters, either established or makeshift, in the movie: Bill is shot by a would-be assassin in one, then thwarts Amsterdam's attempt on his life in another; he and Jenny (the film's romantic interest) used to perform knife-wielding acts for grateful audiences together; Bill's torture of Amsterdam itself becomes an act, performed in front of a mesmerized crowd. What does all this mean? The message is never explicitly spelled out, but it seems to me that the gangs in the picture, in all their tribal customs and lore, are simply performing their own play, acting out their own parts: everything must be scripted to the ancient codes of combat and honor, and their conflict is insulated from the reality that bubbles around and finally crushes them in the Draft Riots (which I'll return to in a moment). The film takes its cue from Children of Paradise both explore a tawdry milieu swarming with street-life and examine the links between the world of the theater and the world outside. What may seem a little less obvious is the imprint of Renoir's masterpiece Rules of the Game. Both Gangs and Rules use theater and performance to comment on a decaying society about to succumb to the tide of historyin Renoir's case, the pre-WWII French aristocracy, and in Scorsese's, the tribes and gangs of the Five Points. Rules of the Game may be the greatest piece of social commentary ever committed to film, and, though Gangs is by no means as deftly or fully realized as Renoir's work, nor as perfect, it does something altogether amazing by adopting some of the same themes and very subtly layering them into what couldn't, on the surface, be a more different movie. In the end, though, if there's one film in history with which to compare Gangs of New York, it's Griffith's Birth of a Nation. Why? Because Gangs is no casual, passive depiction of life back then. It's an aggressive statement about American history. The New York Times' A. O. Scott was one of the few critics to recognize just how radical Gangs of New York really is. As he noted, Scorsese's film pinpoints the defining moment in our country's history as the New York City Draft Riots of 1863. Without ever coming out and saying it directly, the film makes its point clear through the way it structures its narrative and builds, slowly but surely, up to the riots themselves. The shots of a burning New York toward the end of the movie are loaded with meaning: a new era is being ushered in, an old one swept aside. The old America of tribes imported from Europe, battling it out over their territory, is no more: a new identity has been forged for everyone, and the slate, so to speak has been swept clean. As Amsterdam narrates, "For those of us who lived in them furious days, it was as if everything we had known was mightily swept away . . . It would be as if no one ever knew we were there." I've heard so many complaints about the final quarter or so of the movie, that the personal story is subsumed by Scorsese's need to include historical events, that the struggle between the characters loses resonance, that the final battle is anti-climactic. All these criticisms totally miss the point. Scorsese is not interested in the conventional conceit of historical dramasto mesh the personal, character-based story with the grander machinations that surround it. These two worlds are always completely divided in Gangs: the Dead Rabbits and the Natives and all the other gangs live in a world unto themselves, separate from America as a whole, and yet integral to the country's identity. When the Draft Riots arrive, they're not supposed to "mesh" or evenly collide with these tribal conflicts: one's supposed to stomp out the other. The divide is clean-cut because it must be. Scorsese finds in the structure of his narrative an ingenious metaphor for what occurs, in that the story of Amsterdam and Bill halts in its tracks as soon as the Riots interfere. I should perhaps emphasize that the key word in that last sentence is interfere. There is a single moment that defines Gangs of New York as a whole: when Amsterdam's Dead Rabbits and Bill's Natives are decked out in combat gear, prepared to duke it out in Paradise Square, and out of the blue, before the battle-cry is given, a cannonball soars through the sky and smashes into the wall behind one of the gangs. That cannonball is shot from one of the Navy's ships, sent in to quell the Draft Riots. Suddenly, the whole axis of the movie has shifted. The Riots, to which the gangs paid little attention, have finally hit them, and nothing else matters. Their struggles, which before seemed so convincing and full of anger and drive, now seem petty and insignificant. It is hands down one of the greatest moments in movie history, and one of the most daring. We've spent over two hours getting to know the gangs, tracing the evolution of their opposition, and awaiting their final confrontation. 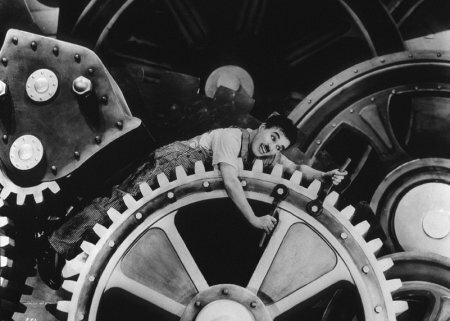 But when at last the time comes, Scorsese throws in a cannonball to send everyone running. On one level, it's absurd and humorous; on the other, tragic. With merciless precision, troops march into the square and gun down one character after another. We can't blame them too much: after all, the Riots, which turned into an attack against New York City's black population, needed to be stopped by any means necessary. But, in the case of the two gangs, here we have men who have agreed to fight without firearms, who are living out of traditions that go back centuries, and all their yearnings and trials and tribulations are rendered meaningless by a line of soldiers with rifles. If the cannonball firing is the movie's definitive moment, the troop's shooting of McGloin, one of Bill's cronies, is a valid runner-up. Although this man has been established as a racist villain, we can't help but be moved by his frantic assault on the soldiers, armed with only a hatchet. One round of fire, and he falls to the ground in an achingly beautiful, bird's-eye-view shot. It seems to sum up the pathos of this momenthow a centuries-old tradition is being swept away. 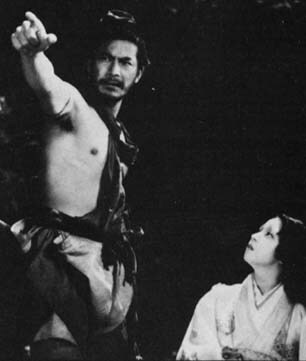 A more recent movie inspired by this same theme is The Last Samurai, which, though altogether a rather mediocre effort, has some good ideas and is worth seeing in comparison to Gangs. 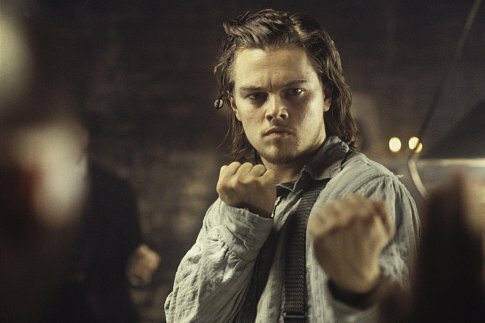 The disparity Scorsese establishes between the quickly modernizing United States and his "gangs of New York" is a thread that runs through the entire picture, right from the beginning. In those opening shots, we wander through a cavernous tenement building filled with music and chants and prayers and warriors preparing for battle. 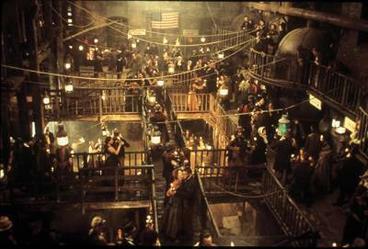 As many critics have noted, this scene is something out of the Middle Ages, and indeed much of the movie's depiction of New York's gangland has that feel. 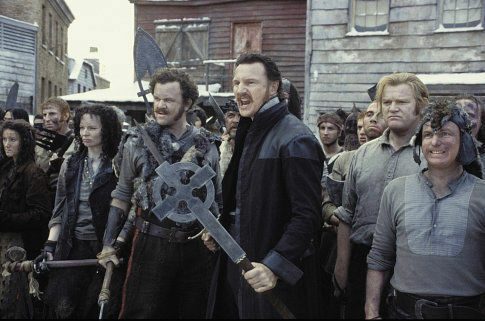 In particular, the way Scorsese constantly grounds the battles he depicts in religion, and never shies away from the faith that led these men into battle (it's hard to even count the number of crucifixes or cross-like images that are contained in the film) harkens back to medieval warfare. And then arrive the ships with their cannonballs and the soldiers with their rifles. No film since Birth of a Nation has offered so bold a statement concerning the forging of the modern United States. As A. O. Scott argues, the great Westerns pointed to the conquest of the frontier as the crucial moment in American history; Griffith emphasizes Reconstruction. 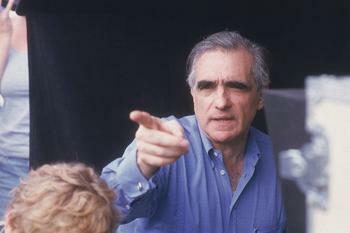 For Scorsese, it was the New York City Draft Riots. After all, as Gangs' motto goes, "America was born in the streets." Scorsese uses this perspective to shape his work, and to defy the conventional rules of storytelling. You don't begin a story, build it up to a climax and then deny a payoff. But that's exactly what Scorsese does, and what annoyed many of the film's viewers. Sure, Amsterdam and Bill do fight, in a brief, masterfully suspenseful sequence that's reminiscent of Enter the Dragon but by then it hardly even matters any more. As hero and villain stare at one another, before Amsterdam finishes Bill off, it would be hard to find any deep hatred in either of the characters' eyes. Sure, Vallon scowls, but he seems to be playing a part rather than expressing his true feelings. Bill simply looks away to the sight of his fellow gang members dying at the soldiers' hands. There's the undeniable sense that the battle of these two men is no longer relevantand they accept that. When Bill dies and we see his eyelid close over the image of the bald eagle, the sun is setting on his America, not just his life. It's therefore significant that Amsterdam never mentions the avenging of his father in the film's final narration. He simply describes the aftermath of the Draft Riotswhich is all that's important at this pointand, in a wonderful line that recalls the closing intertitle of Kubrick's Barry Lyndon , he says: "Friend or foe, it made no difference now." 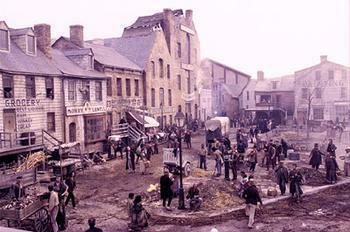 It's imperative to acknowledge what exactly Gangs of New York does, which is more ambitiously conceived than the vast majority of films ever are, takes more risks than most filmmakers would ever consider taking, and does so within the framework of what is, traditionally (by virtue of expenses), the least experimental of genres: the historical epic. Gangs takes a highly localized tale of low-lifes and gangs uneasily coexisting in an urban underworld, sets up an archetypal plot of mythic resonance, and turns it into a grand historical statement, and a meditation on modern American identity. Granted, it stumbles along the way, and parts of it are very clumsily handled (e.g. the romantic subplot), but, for all its flaws, this is a daring and important movie, that deserves more scrutiny (if not praise) than it has received. Let me end with the last shots. The gravestones of Priest Vallon and Bill the Butcher stand side by side (a further elaboration on Amsterdam's "friend or foe" comment) across the river from Manhattan. In a succession of dissolves, the skyline of New York evolves and rises, with the Twin Towers at the end echoing the two gravestones. Some may find this finale cheesy. I see it as a fitting testament to what we've just watched. As we see the years fly past and the skyline of New York evolve, while grass grows over and obscures the graves of Bill and the Priest, we realize that we've just witnessed something incredibly expansive. The pull-back that the ending provides lets us take a breath and reflect on what has been nothing less than a redefinition of American history. It's a movie the history books should take note of, but, more importantly, it's a movie that all movie-lovers should return to. I can't hope to explore all its complexities in three posts, but I hope that I've given some hint as to the incredible amount of artistry and experimentation that is at work in Gangs of New York. I'm sure most will still not agree with me, but I believe Scorsese's film to be the crowning cinematic masterpiece of our time. It's one of the greatest movies by America's greatest living director, and my bet is that its reputation will grow with the years. maturely, and reassuringly, takes over. This movie was the most creative movies ive seen in my life time. Acters and actresses played very well, symbolizes great gang wars from early ages. Handcarved headstones are no doubt the best choice available, all in various types of stone the hand carving adds a certain personal element to the memorial/monument. Personally stonework created using only machines doesnt have the same level of creativlty in my opinion. I keep coming back to this movie, and I never really could explain why...When I bring it up, people either say, "Yeah, that was an ok movie, or "I hated That movie." I still say it is one of the best films I have ever seen, and while I'm no critic or film student, I have to say that Daniel Day Lewis' performance really does rank as high as Marlon Brando in A Streetcar Named Desire, or Jack Nicholson in One Flew Over the Cukoo's Nest. They've become the standard, and every actor who plays these parts on stage or film goes to them for reference (and usually ends up doing a poor impression). Bill the Butcher is now a giant of film. I have more to add, but I guess I'm going on a bit. Anyway, you should enable some sort of spam filter for posts. GREAT read, though. wow, incredible movie and review of corse. Discover the Secrets of Movie Posters Archives!